The High Court is to be asked to dimiss a case over a vaccine for schoolgirls. The Health Products Regulatory Authority wants the court to dismiss a mother's case aimed at securing the withdrawal of a HPV vaccine which is given to prevent cervical cancer. 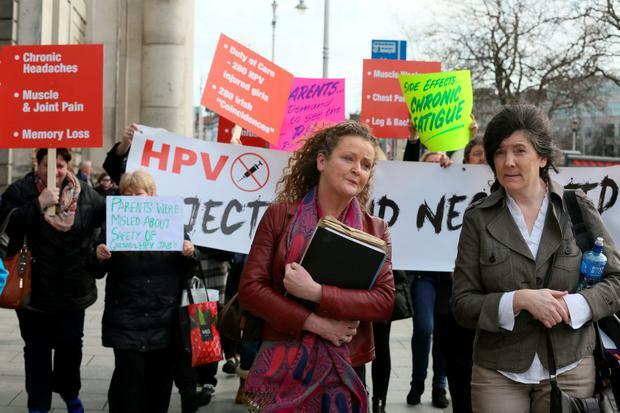 Fiona Kirby, a nurse from Kilbeggan, Co Westmeath, has brought proceedings seeking orders requiring the Authority to withdraw the HPV vaccine. Ms Kirby claims her daughter suffered “horrendous” adverse consequences after being given it. The vaccine, known by its trade name Gardasil, has been offered to school girls since May 2010. A support group called REGRET (Reaction and Effects of Gardasil Resulting in Extreme Trauma) is supporting Ms Kirby’s action. Lawyers for the Authority asked Mr Justice Tony O'Connor to fix a date to hear its application to have the case dismissed. The judge adjourned the matter to that date. The court heard the group were taking legal and medical advice and hoped to bring a report from a US based neurologist when the case comes to hearing. The Authority denies the claims. Mr Justice O'Connor, who set March 15 for the hearing of the application to dismiss, had previously refused an injunction seeking its immediate withdrawal pending the full action.